If you’re a rock climber, a pair of shoes tailored specifically to sheer heights is a must. The footholds you find may be small, requiring a great deal of accuracy. On the other hand, when hiking, a comfortable hiking shoe is needed for what could end up being a very long distance. But the long distances of hiking combined with the risks of climbing require what is known as an approach shoe. These hybrid shoes vary widely in material and weight. Depending on the amount of hiking versus climbing that you are planning to do on a given day. Also to be considered are durability, waterproofing, breathability, and more. For mostly hiking, a lightweight, comfortable shoe with a flexible sole is ideal. For those who want to climb technical rock (more vertical than horizontal), a stiffer-soled shoe that allows edging (the ability to balance the toe alone against the rock) is what you’ll need. Read our full guide on choosing the best approach shoe, and further buying advice below! View the Best Approach Shoes for Climbing, Below. What is the Difference Between Shoes Specified for Approach and Regular Hiking Shoes? Can you go for a Run While Wearing Shoes made for Climbing and Hiking? What Exactly are Shoes that are Meant for Approach? How Should Shoes Design for Approach Fit the Wearer? With a lot of study, time, and experimentation, a person acting as both a hiker and a climber can find exactly the right shoe to suit their own specific needs. 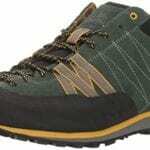 I have researched many dozens of climbing/hiking shoes in order to find the very best shoes for approach. At first, all the options and styles can seem overwhelming. Perhaps there is no “perfect” fit, but with this guide, you’ll be closer to finding the right pair. Selected below are ten such shoes that fit the bill. Are you Mostly Climbing or Hiking? The makers of these shoe models are well aware of the likely need for having both hiking and rock climbing shoes at the same time. It makes sense: a climbable rock is almost sure to require some walking distance before the climber can reach it. But is the rock extremely challenging? Or is the hike to the rock quite short? Both of these situations would necessitate a shoe far more adapted to climbing than hiking along a simple path. In a similar vein, a person who plans to spend the majority of their time climbing technical rock will want a shoe that’s good for edging. These shoes require smoothed rubber patches under a more narrowed toe box that allows for purchase in cracks and other narrow spaces. Without these slight alterations, it would be too difficult to find a secure foothold on the face of the rock. On the flip side is a hike that would take all day with minimal climbing involved. 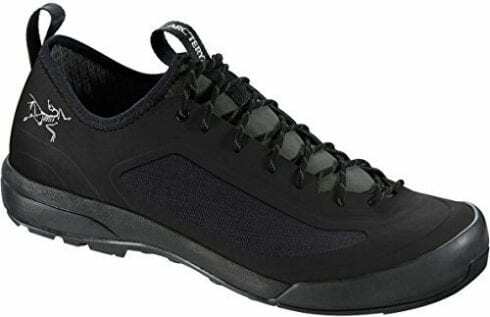 Certainly, the hiker would want a comfortable, flexible shoe equipped to last over a long duration. 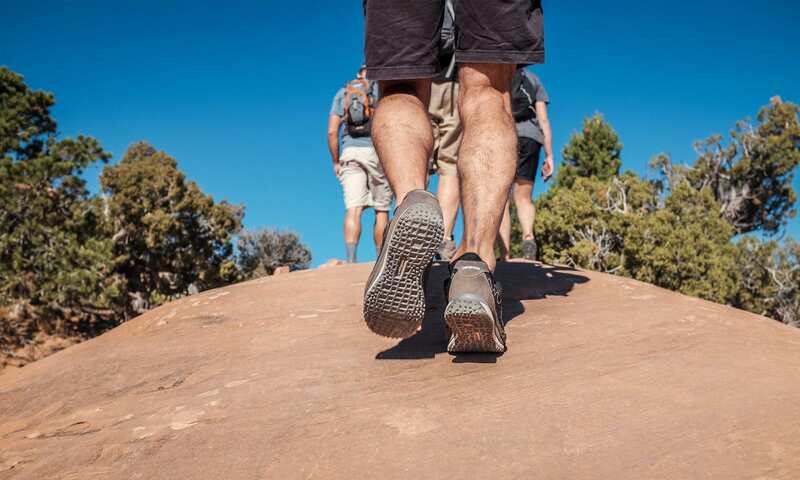 While a stiffer shoe would be great for foot placement on difficult climbs, it would cause a lot of discomforts while simply walking, especially if the traveler is carrying a heavier than average pack on their shoulders. This is an issue regarding what material the upper part of the shoe is made of. Leather can be super strong, but the big trade-off is that it’s not at all breathable. Mesh is an obvious choice to let more air in, particularly in hotter climates. But the disadvantage is that a plain mesh upper will be more exposed to the elements, while also weakening faster than leather. Yet another issue of material is presented by whether or not you want your shoe to have waterproofing. If you get the wrong kind of shoe wet, it’ll soak through to your socks and won’t be fully dry for days on end. The solution is shoes with Gore-Tex (GTX) that are specifically designed with wet climates and conditions in mind. Whether traveling through puddles, rivers, rain, or snow, a Gore-Tex shoe promises some relief from the water problem. A drawback of this is the added ounces that, along with a possibly heavy load and hours of exertion, will only weigh the wearer down more. So if you’re traveling in the desert or other arid areas, the weight—and extra cost—of Gore-Tex is not for you. Any leather upper material is somewhat but not entirely water-resistant shoes, while also durable. In fact, it is the choice material for many of the shoes on our list. On the other hand, mesh upper materials will let water flow right in, but they have their own advantages of allowing the foot to be aired out. A happy medium is hard to come by but can actually be found in some of the synthetic materials provided on this list. All shoes listed here will have a sticky rubber toe rand, a simple measure put in place to guard the toe against getting hurt. In general, consumers should also protect themselves by finding a shoe with a very snug fit, especially if they plan to do a ton of climbing. The feet sliding around inside loose shoes is liable to cause an injury. Be safe by finding a shoe that won’t too badly restrict your feet while not being so loose as to harm you in other ways. With weak ankles or a previous ankle injury, it may be wise to first consider a shoe with mid-height sides (these are harder to come by unless you’re looking for a shoe that’s purely for hiking, and the only one on our list is a version of La Sportiva TX4 called the TX4 Mid). A few of our featured shoes even have a heel lock to ward off the formation of blisters. In the upcoming list, all but one of the shoe models have a “grippy” Vibram sole that is created to achieve maximum stickiness of the outsole to rock. 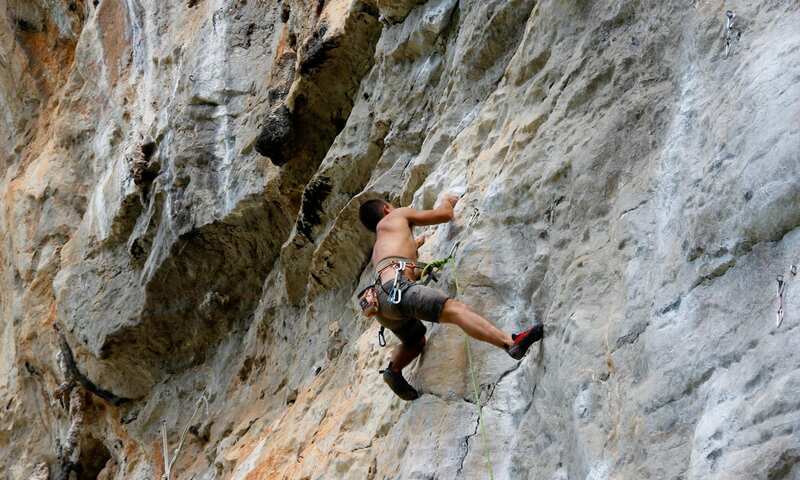 The grip is very important whether the user is hiking or climbing. Precarious and irregular areas come up everywhere in nature. Whether it’s with loose rocks or wet logs, a traveler on the trail has to be very careful. With the right rock climbing shoe, the wearer can move more efficiently and with less worry that they’ll fall or otherwise injure themselves. The wrong shoe would hinder their progress and could cause undue harm. Despite the popular recurrence of this material in hiking and rock climbing shoes, not all Vibram soles are equal. As you will learn, many models have Idrogrip and/or Megagrip compounded in the soles, making for an even stronger hold on the ground. All the hikers and rock climbers out there will have a preference as to which shoe grips most tightly, but shoes with these compound materials are always a safe bet. What follows are ten of the most popular products that are equipped to handle both the hike and the climb that you may experience outdoors. Scarpa is an Italian, family-owned brand that has been producing a variety of outdoor and climbing gear for eighty years now. 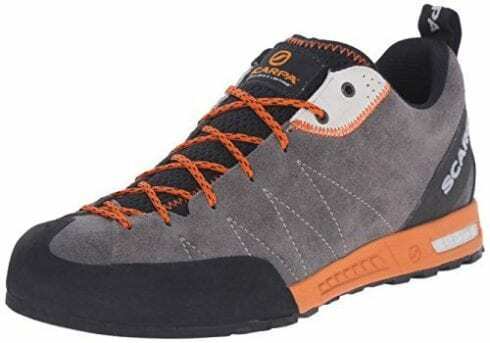 The men’s Scarpa Crux Canvas shoes are some of the best for a combination of hiking and climbing. The built-to-stick Vibram sole aids the hiker on any of the more perilous, loose types of terrain that can be encountered on the trail. The microporous midsole is perfect for comfort and for absorbing shock with each footfall. An EcoPure EVA additive is tasked to promptly biodegrade the plastics in the shoe once it enters the landfill at the end of its use. Scarpa’s hemp upper material is eco-friendly and durable, making for a lightweight design that won’t burden the hiker with unnecessary ounces. This unique material offers pretty good breathability for hotter climates while not sacrificing on durability. The solidity of the rubber soles will make any hiker more sure-footed. Like all of the shoes on this list, the rubber toe rand saves the toes from injury. Likewise, the snug fit of this shoe assures that the foot won’t slide around inside. The Scarpa’s firm soles are made of a thick Vibram rubber. This makes them perfect for more rocky trails. 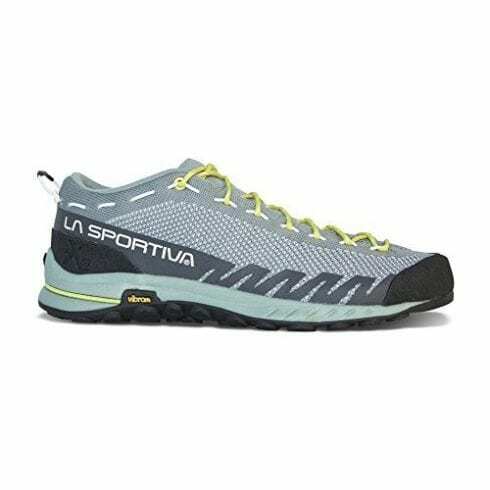 La Sportiva is yet another Italian brand that’s actually been around for ten years longer than Scarpa. For men and women alike, the Boulder X is a hiking and climbing shoe that can be purchased at a better value than most. Though bulkier and heavier than other shoes of its class, a pair of these is a viable option for the cash-strapped outdoorsman. A tough, enduring shoe, the Boulder X will last the wearer for years. The outsoles’ Vibram Idrogrip offers maximum grip. The LaSpEVA insoles are engineered for comfort. The advanced Mythos lacing system promises an adjustable, comfortable fit. The leather upper material ensures that this shoe is more durable than its mesh counterparts against elements like sand and dirt. On the flipside, the leather offers a lower breathability that people in hot climates might want to reconsider. The sole is crafted from Vibram rubber. This shoe’s Vibram Idrogrip sole is equipped with a breaking system that adds grip when stopping suddenly. Whether stopping during descent or traversing wet and slippery terrain, the stickiness of the sole coupled with the braking mechanism will help you out. The stiff soles will require some time to break in but will fit like a glove after a day or two. As mentioned above, the sole is incredibly sticky. Perfect for hiking on less than ideal terrain. 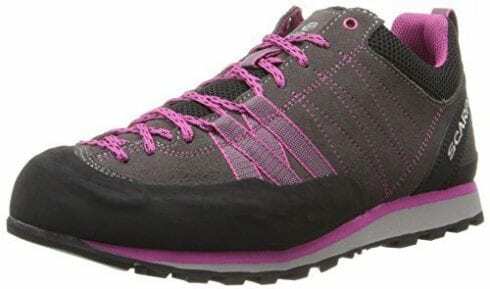 A great women’s approach shoe for comfortable hiking as well as more tricky climbing. Unlike the Scarpa Men’s Crux Canvas, this shoe does not offer the hemp material or EcoPure EVA additive. However, the leather will be longer lasting than a simple hemp upper material. Overall, this is a popular women's approach shoe, and it has a fair value for those who don’t want to break the bank on buying a new pair. The Kevlar webbing anchors the front of the foot, allowing for a more skilled and precision-based edging during climbs. As with the above products, the Vibram adapts well to most surfaces. The lacing offers a clean, adjustable fit. 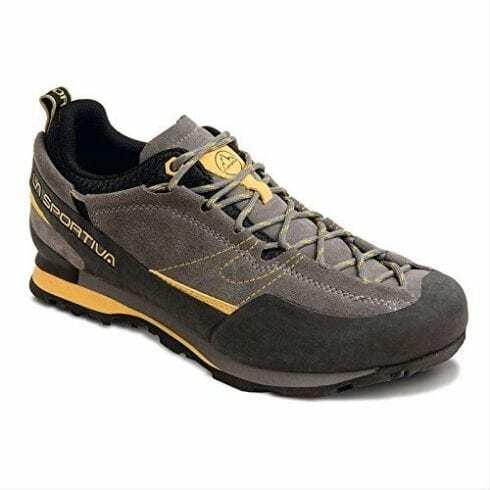 Much like the Sportiva Boulder X shoes, these have a leather upper material that decreases breathability and improves durability. The sole is a simple, sticky Vibram rubber. The leather upper material shields the feet from wet conditions better than a permeable mesh would. The fit is generally found to be a little looser, so about a half-size smaller than your average shoe size would be best for a secure, snug fit. The grip is super sticky. The result is a confidence that the hiker’s step will always be well-placed. Vasque is a company that hasn’t been around for as long as Scarpa or Sportiva, but with fifty years of experience, their Grand Traverse model has made its impact. This Vasque Grand Traverse women’s hiking shoe is ideal for a scramble (a steep climb where the wearer also grips the rock with their hands). While not the greatest at climbing, it serves a hiker quite well when traveling all day. A wonderful combo of durability and breathability is presented by its mixed upper materials. This compromise is rarely found elsewhere! 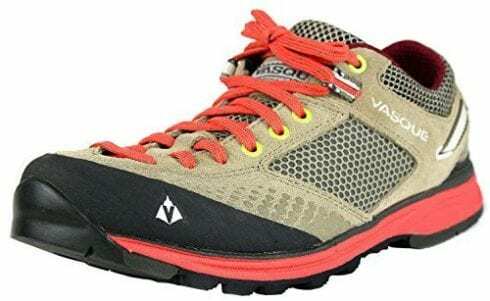 The Vasque Grand Traverse is in this way an unusually balanced and comprehensive shoe. You’ll be hard-pressed to find a mix like the Grand Traverse. The rubber sole is a special Vibram Ibex with Megagrip and Idrogrip compounds, making the Grand Traverse particularly sticky. The webbing heel lock is a great protectant against blisters, while the lightweight TPU outsole of the heel is specially made to last longer in all manner of adverse conditions. The partially leather synthetic upper material is actually well-ventilated, serving its purpose in hotter weather hikes. With these materials, the Grand Traverse has the benefit of being water-resistant. The clunky sole makes the shoe heavier overall, though is somewhat lessened by the lightweight TPU heel. The special heel lock was created with the lessening of blisters in mind, a valid concern for someone wanting to walk all day. The soles are sturdy yet flexible, making for a comfortable all-day hike. As mentioned, the Idrogrip and Megagrip compound in the sole promises a safe step that will help the shoe to stick to many surfaces. For men seeking a slightly pricier, streamlined shoe, the Gecko could be the way to go. Geckos are minimalist and easy to look at if you’re inclined to look at style. This pair of lightweight shoes is comfortable for many hikes but shines when it comes time to climb technical rock. The EVA foam midsoles are quite cozy. As is typical, the leather makes the Scarpa Gecko shoe sturdy but less breathable. Due to its pared-down aesthetic, it won’t be the most durable shoe out there. Consumers may not want to continue buying the same pair of shoes more often than they need to. The sole is Vibram rubber with Idrogrip for extra sticking. For climbing, this model is fantastic. Hikers have reported doing difficult climbs without hesitation when equipped with these Scarpa Gecko shoes. The sole is not especially thick while still being solid enough for challenging climbs. The outsoles are ideal for gripping at technical rock. Climbing is no problem for Scarpa Geckos. Salewa is a lesser known European company that’s been producing shoes for about 75 years. 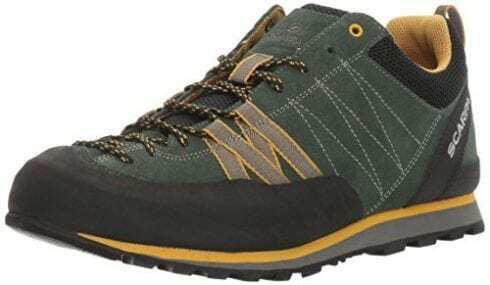 The Salewa Firetail 3 GTX is a men’s shoe that’s made to stick even in wet or snowy weather, so depending on your location, these could be best for you. The waterproof Gore-Tex only improves upon its already formidable durability. Surprisingly, the Salewa Firetail 3 GTX approach shoe is fairly lightweight as well. For the price paid, a shoe like this is a sure bet. The smoothed-down toe is perfect for any edging you may run into. The sole is the usual Vibram but with added Reptail and Megagrip compounds that greatly increase stickiness. The climbing lacing helps the user’s shoe fit just right. The breathable, mesh upper material is suited to hot climates and is made with waterproof Gore-Tex. All in all, the Salewa Firetail 3 GTX approach shoe will survive a lot of wear and tear. The Vibram sole is fairly standard on almost all shoes made for approach. You can be certain of a safe, sticky step. The smooth area on the bottom of the toe is suited to edging, so it’s great for climbers. 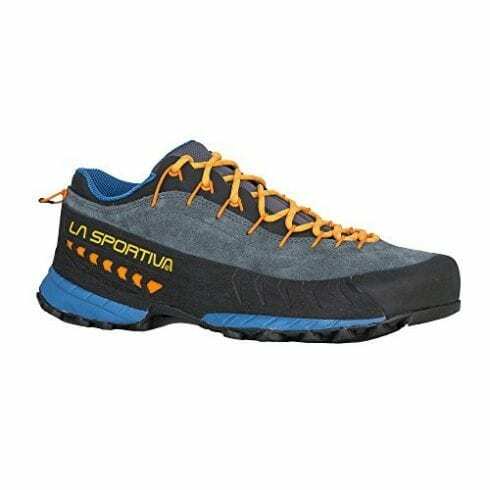 This La Sportiva TX4 Mid GTX is a men’s shoe suitable for both climbing and hiking. Note that this shoe also comes in a model called TX4 Mid GTX that has the not often seen addition of a mid-height top to protect rolling of the ankle. Admittedly heavier than most, the TX4 is built to survive. In climbs, it doesn’t perform quite as well as its cousin La Sportiva Boulder X, but it still holds its own. The very same can be said for edging. It is most noteworthy for its endurance and comfort on long, heavy pack hikes. The Trail Bite Heel Braking Platform allows for a fast halt. This feature is comparable to La Sportiva Boulder X. Its Vibram sole is, as always, very sticky. The upper material of the La Sportiva TX4 Mid GTX is synthetic, resulting in a durable, breathable model that is also waterproof. This is easily compared to the Vasque Women’s Grand Traverse model mentioned earlier. For going downhill, the impact brake system and Vibram rubber serve their purpose well. The soles have exceptional stickiness. Great for hikers. Hailing from British Columbia, the Arc’teryx brand puts forth a stylish men’s shoe that proves to be lightweight and very cozy. The water-resistant and seamless nylon will keep the feet comfortable and dry in any unexpected weather. Speaking of comfort, the soles of the Arc'teryx Acrux SL are quite flexible. Unfortunately, this makes the Arc'teryx Acrux SL weaker in terms of edging, as compared to brands like Scarpa and Salewa. Buyers may wish to reconsider this model if they’re going to do some serious climbing in the future. The Arc'teryx Acrux SL doesn’t look like your typical hiking and climbing shoe and comes in plenty of colors. It has a feather-light and comfortable design. Again, its nylon upper material offers a good waterproofing. The sole is made of a simple Vibram. Climbers can count on Arc’teryx to safely navigate cracks and wet terrain. The sole is flexible and comfortable for a hike. Under the toe is smooth Megagrip rubber compatible with more robust climbing. This is a climbing and hiking shoe available for men and women that is similar to the Scarpa Men’s Gecko in its minimalist exterior. It is very lightweight and comfortable. The model is supportive as well, lasting on long hikes while also being up to the challenge of any climb a user can throw at it. The laces extend down to the toe, providing an even snugger fit than the TX4. This offers better edging capabilities. The Vibram Megagrip soles are stickier than the plain Vibram found in any of the Scarpa models. With minimal bells and whistles, the TX2 is quite light, though not especially durable. The seamless polyester upper material boasts a quick dry in wet conditions. It is well worth noting that the foot needs protection from injury but needs to be saved from the elements as well. The tongue and lacing system guard the foot from rocks or snow that may try to get into the shoe. The Vibram Megagrip sole works well for users expecting a good climb. From the American footwear company Five Ten comes the Guide Tennie , a very supportive women’s shoe. It does its best on long hikes while also being a good climber. Smooth rubber on the toe box means it can handle edging and cracks with ease. The Proprietary Smedge Zone advances edging. The Stealth C4 Dotty tread on the outsole is shock absorbent. The suede upper material is durable, though not especially breathable. Unlike every other shoe on this list, Five Ten's Guide Tennie features the Stealth C4 instead of the more prevalent Vibram rubber. Keep in mind that the Guide Tennie approach shoe does not grip well on wet surfaces. The Guide Tennie approach shoe can edge almost as well as a regular climbing shoe. The most obvious difference can be seen by even the layman’s eye: on a hiking shoe, the ankle is completely covered, offering extended protection. The sides of a shoe made for approach don’t reach nearly as high. The high sides wouldn’t work out well for someone who needs to climb. Restricting the mobility of the ankle vastly reduces shock absorption. And if you’re still not convinced, an unexpected benefit of a lightweight rock climbing shoe is that it will strengthen the ankle more than a plain hiking shoe would. Also, hiking shoes are often much heavier and more cumbersome than a shoe that compromises between hiking and climbing. A lot more energy is expended in the more difficult climbs than is expended by a straightforward hike through the woods. Plus, it’s been repeated by many that carrying something so heavy on your feet is a far greater strain than carrying that same weight on your back. 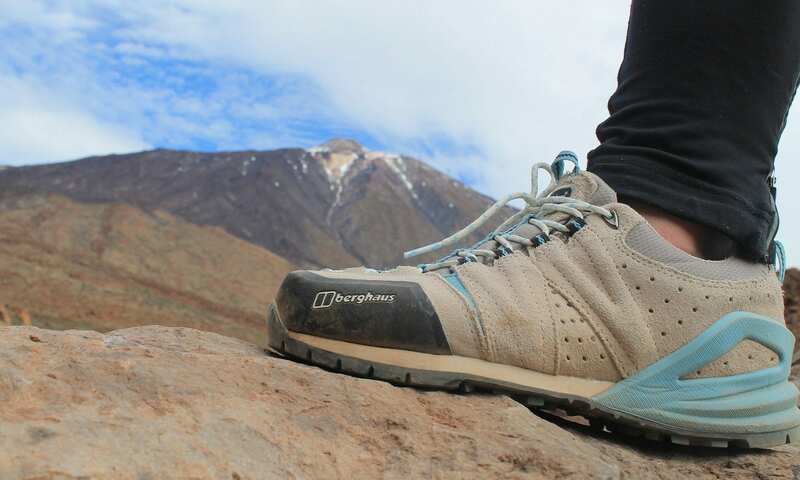 Therefore, regular hiking shoes are a no-go for a person who is dedicated to climbing. Well, you can try! After all, you could try running in flipflops if you were so inclined. Now obviously a shoe created for approach won’t be as bad as flipflops for women or men, but is it worth it to wear a shoe not specifically engineered for running? All shoes have their advantages. Running shoes have the great benefit of being more light and fast than climbing and hiking shoes. This means that if you used shoes for approach on your morning run, you may just be tired out a little quicker. On the positive side, hybrid hiking and climbing footwear is more durable than the average pair of trail runners, lasting potentially hundreds of more miles than that latter. In sum, conventional wisdom dictates that it’d be best to try running shoes for running. That said, you never know until you try something different. If you’ve read ahead, you’ll notice that there are mainly men’s shoes on this list, but what is the top hiking shoe tailored to women? I and many others would argue that the Scarpa Crux Women’s shoe takes the cake in this competition. The Crux is a strong, durable shoe that holds its own on hikes as well as during intense climbs. Edging is no problem in a Crux. The shoe is also supportive and comfortable enough to be rated highly by the women who have tried it out. 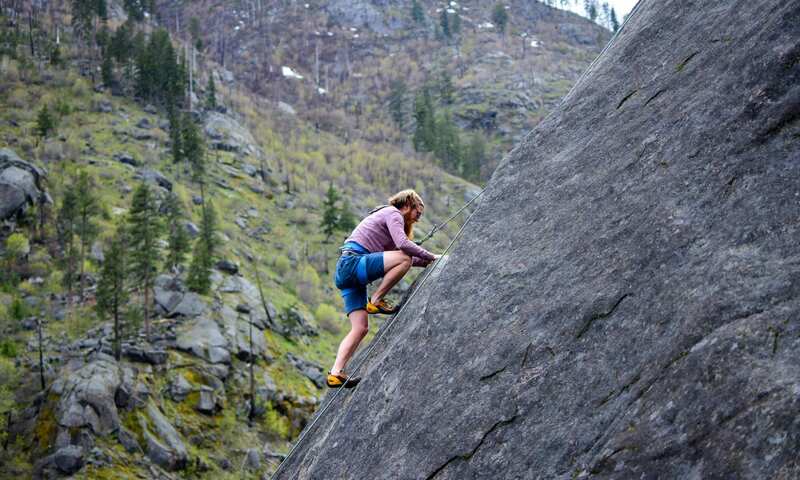 Many of these women go back to the Crux, again and again, marking it as their shoe of choice when it comes to hiking combined with technical rock. Simply put, an “approach” is all of the hiking that happens before the upward climb. 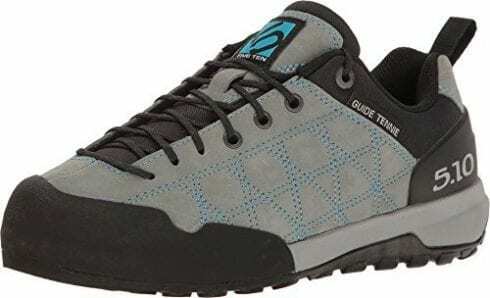 The top climbing approach shoes are therefore ones that are comfortable for both the hike and the climb, which will reduce the need to carry two pairs of shoes on your person. Shoes made with the approach in mind will eliminate that extra weight. Shoes for Approach are good for Hiking, but are Trail Runners good for Hiking? The problem with trail runners is that they’re a totally different type of shoe. Trail runners, by nature of their name, are made for fast speeds rather than a slower, drawn out endurance. And though it’s true that they are nice, light and fast, trail runners aren’t wide enough at the base for a serious hiking trip. This is a fundamental reduction in support that you are going to sorely miss. Especially if you’re hiking with a heavy load, trail runners are not for you. And trail runners are certainly not tailored to the unique challenges of climbing and edging. One thing to look out for are shoes that should be pretty snug on your foot. This prevents slippage of the foot inside the shoe when going for a climb. If you’ve ordered online, send a too large or too small pair back and adjust your size accordingly. Your feet will thank you. To conclude, you must think carefully about what you will most want to do with your shoes. Where are you going? Is the place in your area and will be a place you return to again and again? Otherwise, it might not be worth it to look into pairs of approach shoes for that particular climate. Ask yourself if the weather is typically arid in your area or if it rains or even snows a lot. Grab snowshoes here! Most importantly, are these shoes going to be applied to a long hike and a brief, easy climb? Or is the hike going to be over in a flash, followed by an arduous climb? The question next whether you’re looking for durability or breathability, as it’s often the case that you cannot have both. The material of the shoe will be paramount in this case, and it will also have a huge effect on the weight of your shoes. Keep in mind that what’s good for one person may not suit another. Before looking around, make a list of what you want most. Researching Amazon reviews and other websites with customer feedback will aid you greatly. Good luck on finding the best hiking and rock climbing shoes for you! In terms of fit, the snuggest shoe is most important with climbing. If you’re prioritizing a long hike, you actually can get away with a loosened fit. Read more in this study. Since its invention in the 80’s, the Guide Tennie’s special Stealth rubber is used by both NASA and the military. We hope you enjoyed our article on "Top 10 Best Approach Shoes", if so, please share and rate it.